Rollin' down the river with Proud Mary and her krazy krewe! : New Hat! Trying to find hats that fit Liam are nearly impossible. 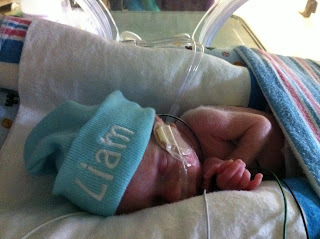 Even the smallest "micro preemie" hats are still to big. I found this website and took a gamble and ordered some hats because they were very affordable and well...they fit! Check out his hat! I think he just looks like the cutest little thing in it. Today we had a photo session in the French Quarter. We had to bribe Noah with everything under the sun to get him to smile and behave. You forget how nice the quarter is during the day. It was very nice to just walk around. We took some pictures in Pirate Alley and Noah was so afraid Captain Jack Sparrow was going to come out and get him! Hehe. Hopefully we have at least one group shot of the 3 of us, I wish Liam was there to partake! Crazy that our first family photo will be once he comes home from the hospital and he will be a couple months old! We will get the pictures in a couple of weeks, stay tuned!